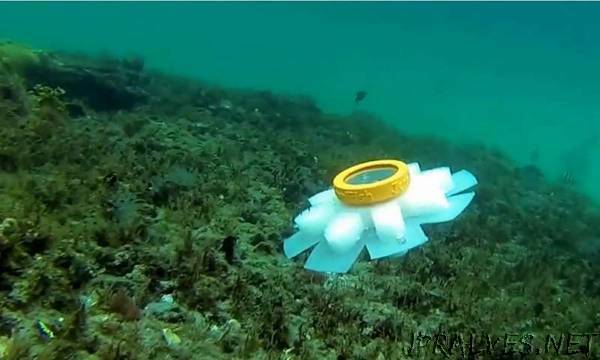 “New robot jellyfish could be the key to monitoring and caring for fragile parts of the world’s oceans without damaging them. The robots were developed by a team of US scientists, from Florida Atlantic University (FAU) and the US Office of Naval Research. They were designed to be able to swim freely, steer from side to side, and swim through narrow openings. The researchers set out their findings today in the journal Bioinspiration and Biomimetics. Corresponding author Dr. Erik Engeberg, from FAU, said: “Studying and monitoring fragile environments, such as coral reefs, has always been challenging for marine researchers. Soft robots have great potential to help with this. To harness this performance, the researchers used the shape of the moon jellyfish (Aurelia aurita) during the larvae stage of its life cycle. Whereas prior robot jellyfish designs used a variety of different propulsion mechanisms, the team’s design for their new jellyfish used hydraulic networks for propulsion. To allow the jellyfish to steer, the team used two impeller pumps to inflate the eight tentacles. The impeller pump design produced an open circuit of water flow, where water from the environment was pumped into the soft actuators to produce a swimming stroke. When the pumps were not powered, the elasticity of the tentacle actuator silicon rubber material constricted the actuators to push the water back into the environment during the relaxation phase. This elasticity is like the passive elasticity demonstrated by live jellyfish after bell contractions. The design also removed the need for valves, reducing control complexity, space requirements, and cost. The team 3-D printed five different robot jellyfish, using silicon rubber for the actuators. Each jellyfish had a varying rubber hardness to test the effect it had on the propulsion efficiency. They also tested the robots’ ability to squeeze through narrow openings, using circular holes cut in a plexiglass plate.